The Emergence of Native Alaskan Political Capacity, 1959-1971, Alexander M. Ervin, Department of Anthropology and Archaeology University of Saskatchewan, Saskatoon, Saskatchewan, Article published in Musk Ox Journal, 19, 1976. Used with permission of the University of Saskatchewan, Department of Geological Sciences, for educational purposes only. ABSTRACT. This paper demonstrates the increasing political competence of the native Alaskan leadership during the period 1959-1971. This competence is measured by their ability to successfully use existing American political institutions and tactics to influence government policy which affected their native constituents. However, it should be noted that this competence did not emerge in a vacuum but was spurred by a set of crises in which native villagers found their access to land and resources seriously undermined by State and Federal withdrawals of land. Native land utilization had formed the basis of a tenuous 'dual economy' based on hunting, trapping, and fishing, and seasonal cash employment. If this erosion of native subsistence rights had continued the native economy might have collapsed and village isolation would have ended, leading to serious cultural disintegration. In response to these crises native protest organizations were formed in the separate ethnic regions of the State, and as an expression of some degree of Pan-Native unity, the Alaska Federation of Natives was formed in 1967 to pursue the land claims question. This was an important event in the history of native political interest group, an institution which is so characteristic of American politics. Yet that organization was intended to resist the acculturative trends directed and dominated by the institutions of the larger society and to seek means to control socio-cultural and economic change to the benefit of native Alaskans. The bulk of this paper focuses on how the A.F.N. overcame internal problems of organization and through various tactics (use of the courts and Congressional hearings, through the seeking of normative support and interest group alliance) sought and gained a Land Claims settlement from the U.S. Congress in 1971. The Congressional Act was remarkably close in form to the original bills sponsored by the A.F.N. Finally, the significance of this Act to future native economies is discussed. Interferences by Euro-American political and economic interests during the period 1959-1971 led to the formation of political interest groups among native Alaskans. These organizations were part of a more general trend whereby Alaskan natives began effectively to participate in American politics. The focus of these events was the question of Alaska Native land rights, leading to the formation of the Alaska Federation of Natives (A.F.N.) The results of negotiations by the Alaska Federation of Natives with the American Congress culminated in what some would consider the most liberal, innovative and economically comprehensive land settlement legislation in the history of American relations with its original inhabitants, the Indians, Eskimos, and Aleuts (see for example, French 1972). The purpose of this paper will be to demonstrate the history and mechanisms of the developing political capacity of Alaskan native leaders in their search for a settlement to the land claims issue. Besides pursuing the issue of native land-ownership, native leaders were also concerned with gaining political and economic power, in order to provide the means for development of new types of native social and economic structures, which in turn could provide the means to prevent further uncontrolled trends of acculturation and assimilation brought about by ever-growing Euro-American institutional and economic influences (Hensley 1970). Their activities were not designed simply to encourage the maintenance of a native 'status quo' or the revival of a native past. The major purpose was to provide more comprehensive choices of life-style and economics to native people in many settings, both rural and urban. Given the realities of the American social system this could have been directed only through native participation in existing Euro-American political and economic institutions. Before describing the land claims struggle, leadership and the resolution of land claims it would be appropriate to give a background to the socio-economic motives for forming native interest groups and the legal bases of the land claims. One noteworthy feature of the development of the Alaskan Native Land Claims movement was the fact that it required the development of some degree of political unity among the 53,000 Alaskan natives of diverse ethnic backgrounds. Their ancestors (numbering around 74,000 before the intrusion of Russian fur traders) belonged to various distinct Indian, Eskimo and Aleut linguistic and cultural groupings (see Figure 1 - click for larger map). Cultural-historical experiences along with considerable ecological variations in topography, climate, resource utilization, etc. largely account for rather extreme cultural and linguistic differences, compared to the range of differences found among northern Canadian native groups. Moreover, in Alaska there was no real unity within even a single ethnic grouping; for instance blood-feuding among clans was a very prominent feature of Tlingit society (Drucker 1958). Units of social and political affiliation rarely extended beyond the village although occasionally to restricted extra-village alliances. Much more could be said about the aboriginal societies and their variations, but that is not the purpose of this paper. For further reading on aboriginal Alaska, see Bank 1958, Chance 1966. Drucker 1958, and Oswalt 1967. The shared experiences of enduring both the Russian and Euro-American colonial presences with attendant acculturational effects, led to increasing similarities among the multitude of ethnic subgroupings in Alaska. Some of the very broad consequences of these colonial experiences include: (i) "boom and bust" economies such as the fur-trade and the Gold rush that often left native communities unsettled and sometimes desolated; (ii) the introduction of epidemic diseases and alcohol; (iii) relative poverty with the partial destruction of native subsistence bases; (iv) attempts to acculturate native people through educational and religious institutions; and finally and perhaps most importantly (v) the introduction of external government agencies such as the Bureau of Education and the Bureau of Indian Affairs whose bureaucrats came to manage much of the social and economic affairs of native villagers. Native people had to learn to adapt to these governmental agencies, especially since their policies would often vacillate between extremes of paternalism and "laissez-faire." For some further references to these colonial experiences, see Chance 1969, Hinckley 1968, Hippler 1968, Jenness 1962 & 1968, and Rogers 1962. A second trend which contributed to a potential sense of common purpose among Alaskan natives was found in the development of "dual economies" (Abrahamson 1968). In a broadly acculturative setting, Alaskan natives found themselves in a position where they had to combine limited seasonal cash and wage employment opportunities with traditional subsistence activities which in turn had been gradually modified by a Euro-American technology. As will be demonstrated shortly, these dual economies of separate regional ethnic groupings were threatened with destruction by commercial development sponsored by the revenue-hungry State of Alaska. Native Alaska's dual economy can be contrasted with the relatively developed economies of two major sub-regions of Alaska, "Railbelt Alaska" and Southeastern Alaska (see Figure 2 - click for larger version). Both of these regions are populated predominately by non-natives, are urbanized, and have developed economies and transportation systems. Defense spending, oil and gas developments, logging, and commercial fishing provide wage employment and support for the approximately 200,000 non-natives living in these two regions. Moreover, although both of these regions have significant native minorities, it could be said that life styles and economies are generally similar to those in the contiguous United States. The native people largely live in what has come to be known as Westward Alaska (see Figure 2), and it is there that they have come to rely on the dual economy. Even though cyclical urban migration to such cities as Anchorage, Juneau, and Fairbanks is becoming a significant demographic feature (Hippler 1969), 37,000 natives out of the estimated total of 53,000 in the late 1960's lived in 175 villages and small towns which were predominantly native. During the 1960's natives in Westward Alaska lived on the public domain rather than on land that they owned. Permanent employment in the villages was rare and consisted primarily of government jobs (including the positions of teachers, Bureau of Indian Affairs administrators, postmasters, etc.) and most of these jobs were held by the few resident whites. Living costs were very high. For example, the town of Bethel has a cost of living 85% higher than that of Seattle. The vast majority of natives had very low cash incomes; in 1967 the average per person was $600.00 as compared with $3,629.00 per person in Alaska as a whole. The cash received by Alaskan natives came largely from temporary wage labour, primarily through summer employment in construction, firefighting, commercial fishing and canning, and secondarily from State and Federal welfare, and service in the Alaska National Guard (Arnold 1969). 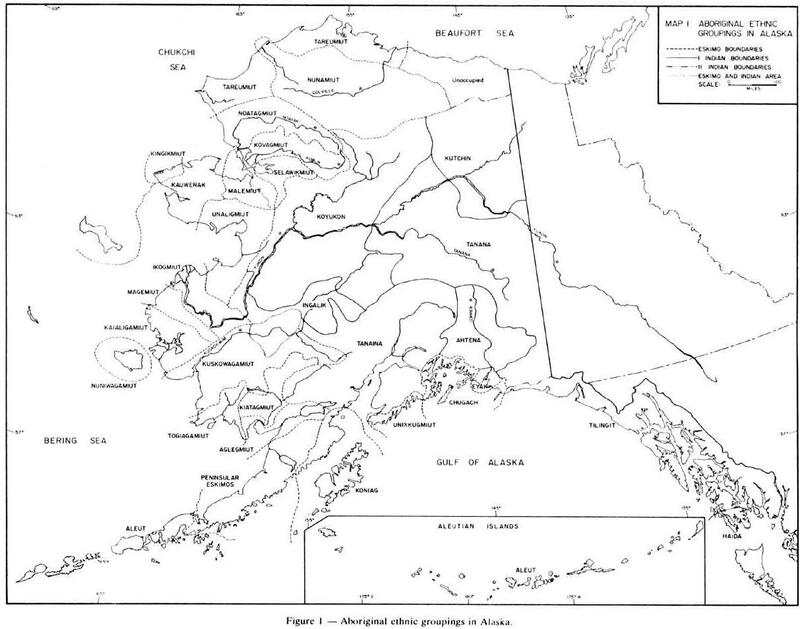 As a result Alaskan natives still rely most heavily upon the resources of the land and sea. These subsistence activities vary with the locale in Westward Alaska. Salmon and waterfowl are the mainstay of the Yukon-Kuskokwim River deltas. Marine animals such as walrus, seal, polar bears, and beluga are important in the northern coastal regions. The Interior Indians depend upon fish, caribou, moose, and fur-bearing animals, such as bear, beaver, muskrat, and martin as well as ducks and geese (Arnold 1969). Klein also underscores the significance of the subsistence economy to native Alaskans. The basic economy of the entire Yukon-Kuskokwim Delta area is that of subsistence, hunting, fishing and gathering. The major portion of the food consumed by the people and their dogs come from wildlife resources; virtually all of the fuel for cooking and heating is locally obtained wood or seal oil and much of the Eskimo clothing is made from the hides of the marine and land mammals of the region (Klein 1966:323). There is much more that could be said about the social and economic conditions of Westward or Native Alaska, but this brief discussion is meant to demonstrate two basic conditions that came to be shared by diverse native communities throughout the State. One of these was the gradually increasing and somewhat imposed dependence upon Euro-American governmental agencies, such as the Bureau of Indian Affairs, the Alaska Public Health Service, Bureau of Land Management etc. The other was the development of separate but parallel dual economies. Both of these shared features can be seen in the light of what the political scientist David Truman (1951: 40) has called 'tangential relationships.' Tangential relationships partially provide the motivation under which people who could potentially form a political interest group overcome their inertia and organize. Categories or sub-groupings of people come to share or fulfil their potential common interest through a similar form of interaction, similar form of behaviour or similar relationship with another agency independent of themselves. Truman (ibid) suggests that when any such tangential relationships are disturbed, the affected individuals are likely to seek adjustment through interaction with other people in the tangent group. As we shall shortly see, Alaskan native groupings, separately and as a whole, were seriously threatened in their delicately balanced dual economy by State and Federal land selections. Their response was to form regional and ethnic interest groups which later allied into the Alaska Federation of Natives. But before outlining that process, it is important to trace the legal implications of land ownership in Alaska, which provided the ultimate justification for an Alaskan Native Land Claims Act. Native ownership of land in Alaska was not resolved with the American purchase of Alaska in 1867 (Treaty of Cession) nor was it to be resolved for over 100 years, until the passage of the Alaska Native Claims Settlement Act in 1971. During the interval there had been several laws recognizing that Alaskan natives had legal rights to land and pointing out the necessity of resolving land claims. In 1966 some of these documents were to provide the justification for a land freeze on state selections of land, a freeze imposed by the Secretary of the Interior at a time when native land rights were directly threatened by the newly formed State of Alaska. These laws plus the Land Freeze of 1966 provided the justification and the necessity for the Settlement Act of 1971. The first of these laws was the Organic Act of 1884, a law primarily designed for the purpose of organizing Alaska as a territory but which also gave protection to native subsistence activities. The Indians or other persons in said district shall not be disturbed in the possession of any lands actually now in their use of occupation or now claimed by them but the terms under which such persons may acquire title to such lands is reserved for future legislation by Congress (Act of May 17, 1884, 23 Stat. 24). During the drive for Alaskan statehood in the 1950's, there was general concern that the undefined native land rights would come to haunt the political economy of the future state. And, of course, these concerns were to prove correct. Such anxieties were expressed at various Congressional committee hearings and at the Alaska Constitutional Convention. The Statehood Act (Public Law 85-508) was passed in 1958. Because of the unstable basis of Alaska's economy, the new State was granted a very generous amount of land from the Federal public domain; article 6 of the act allowed the State to select 102,550,000 acres within twenty-five years of admission into the Union. This section later came into conflict with another section (4) of the Statehood Act which protected native lands and subsistence rights. Section 4. As a compact with the United States said State and its people do agree and declare that they forever disclaim all rights and title to any lands or other property not granted or confirmed to the State or its political subdivisions by or under the authority of this Act, the right or title to which is held by the United States or is subject to disposition by the United States, and to any lands or other property (including fishing rights), the right in title to which may be held by any Indians, Eskimos or Aleuts (hereinafter called natives) or is held by the United States. For said natives. that all such lands or other such property, belonging to the United States or which may belong to the said natives shall be and remain under the absolute jurisdiction and control of the United States until disposed of under its authority. Yet as we shall see native land and subsistence rights were directly threatened by the State and Federal governments in spite of these legal protections. Before proceeding it should be pointed out that Margaret Lantis (1973) has outlined some of the early motivating forces for Alaskan native political activity but for the purposes of continuity those events will also be summarized here. Prior to Alaskan statehood in 1959 Alaskan natives were, for the most part, left undisturbed in their subsistence relationships with the land. There were few clear-cut cases of native land ownership but for that matter most other Alaskans were devoid of land title since the Federal Government owned over 90% of the land (Task Force on Alaskan Native Affairs 1962: 65). This changed with statehood since the newly formed State could now select 103,000,000 acres from the public domain for its own use and for leasing to commercial interests. This provision along with other policy changes by the federal government threatened native subsistence and in turn politicized native groupings. The earliest crisis revolved around a proposal by the Atomic Energy Commission in 1959 (known as Project Chariot) to create an artificial harbour at Ogotoruk Creek on the Chukchi Sea. To accomplish this an underground nuclear blast equivalent to 2,400,000 tons of TNT was planned. The residents of Point Hope and other nearby Eskimo villages were concerned about their livelihood and about possible damage to valuable caribou and sea-mammal resources from such a blast. The project was eventually shelved because of the protests of scientists, conservation groups, and the Eskimo themselves, but there remained a considerable amount of uncertainty and feelings of vulnerability on the part of the Eskimo. Soon after the announcement of Project Chariot, in May 1960, two Eskimos were arrested at Barrow for shooting ducks out of season. In protest 138 Barrow Eskimo, each bearing a duck, also demanded to be arrested. According to one informant, the U.S. Fish and Wildlife Service had lost much of its power of jurisdiction in the process of statehood, and because of this had begun to enforce previously ignored laws in order to justify its large inventory of personnel and equipment. The Eskimos argued that they were entitled to aboriginal rights to hunt waterfowl at any time of the year especially in view of the monotony of a perennial diet of whale meat and expensive, store-bought starchy foods. Although the protest was most evident in the northern coastal regions, the law was being rigorously enforced throughout most of Westward Alaska, threatening the dual economy of the whole region. Soon after these crises, correspondence was initiated with Alaskan natives by the New York-based American Association of Indian Affairs. This group agreed to help finance a general meeting of North Slope and Chukchi Sea village leaders. The meeting, designated Inupiat Paitot meaning People's Heritage, was held at Barrow in November 1961. In addition to a discussion of the two important issues of hunting rights and Project Chariot, committees were formed to study longstanding issues of acculturation such as health and education. As a result of this meeting a communication network was established among the Eskimo of the northern part of the State, and the delegates agreed to continue their annual meetings. Out of this evolved a formal native organization. Furthermore, there was decision to form a State-wide native newspaper, the Tundra Times, financially assisted initially by the late Dr. Milton Forbes of Waldon, Massachusetts, and edited by Howard Rock of Point Hope. It is no exaggeration to view this first meeting of Inupiat Paitot as the pivotal event in the formation of native associations in the State. A similar meeting was held at Tanana in June 1962. Representatives from Athapaskan villages of the Upper and Middle Yukon Valley met to discuss duck-hunting rights and the status of lands, since many of these villages had filed aboriginal land claims with the Indian Claims Commission in the early 1950's but with no response from the Federal Government. From this meeting emerged the organization to be known as Tanana Chiefs. Shortly after this meeting, the Tundra Times began publication, initially serving the interests of Inupiat Paitot and Tanana Chiefs. Early issues carried paid political advertisements and interviews with opposing candidates for the 1962 State and Federal elections. Politicians immediately recognized the potential influence of the Tundra Times on the native vote. Other land issues arose which stimulated native unity and fostered the development of other regional associations. In 1963 the Athapaskan residents of Minto were threatened by a State proposal to claim the Minto Flats area and part of the village of Minto itself for tourist duck-hunting facilities. The people of Minto, led by Chief Richard Frank, protested that their aboriginal hunting and fishing rights were being threatened. The Tanana Chiefs, with the assistance of attorneys, then sent a petition to U.S. Secretary of the Interior, Stewart Udall, asking for a freeze on further State selections of lands. This freeze, imposed in 1966, was to be based on the Organic Act of 1884 which guaranteed that native people would not be disturbed in their land use. Both the legal provisions of the Organic Act and the land freeze of 1966 were to provide important leverage toward an eventual land claims settlement. A very serious controversy had arisen in April 1963 over the proposed Ramparts Dam Project, a hydroelectric scheme which was to have flooded 9,060,000 acres of wildlife habitat including very important duck-breeding marshes, besides displacing several Indian villages in the Upper Yukon Valley. The Tanana Chiefs, a local organization known as Gwitchya Bwitchan Ginkhye (The Yukon Flats People Speak), and non-native conservationist groups such as the Council of the Wilderness were able to pressure the Federal Government into shelving the project. But as with Project Chariot, the proposal had created a sense of uncertainty and vulnerability among Interior Indians. At about this time there arose a land issue which was resolved early and had positive implications for native people. Oil was discovered on the Tyonek reservation across from the city of Anchorage, and a controversy arose when leases were sold by the Bureau of Indian Affairs to an oil company. By means of a Federal court order issued in 1963 the lands rights of these Indians were established and the oil leases were transferred to the people of the reservation. Since 1963, the 150 residents, formerly impoverished, have received over $13,000,000 in revenues from oil operations. The villagers bought part-interest in a construction firm and, providing their own labour, built 50 modern homes, a new school, and a new Russian Orthodox Church. They also set aside a portion of the reservation for industrial use. The Tyonek management Corporation has also invested some money in a small airline and in Anchorage real estate. Because of the seriousness of the various land issues, the success of the Tyoneks, and the growing influence of the Tundra Times, regional organizations sprang up where none had existed before (see Table 1 and Figure 3 - click figure for larger version). Almost immediately these organizations filed land protests with the Interior Department. By 1968 there were 19 regional and city native organizations where there had been only one in 1961, that being the Alaska Native Brotherhood located primarily in the southeastern part of the State. Arctic Slope Native Association Eskimo North Slope 1966 replaces "Inupiat Paitot"
Early in the formation of these organizations there had been talk of federation. Associations would exchange observer delegations at conferences. In June 1963 a Conference of Native Organizations was held in Fairbanks. The principal theme was the necessity for active native political participation and eventual unity. Although federation was not achieved at this time. the communication network was greatly extended, making eventual federation much more feasible. Finally in 1966, 300 native leaders met in Anchorage at the invitation of the Cook Inlet Native Association and with the financial backing of the Tyonek reservation. The purpose was to form a federation of native associations. Several meetings were held over the next year, at which constitutions were drafted and executives elected. For a while it seemed that federation could not be accomplished because of regional rivalries manifested in constitutional arguments. However, there was a general awareness among native leaders that they must establish a united front since there were already several land claim settlement bills being drafted in Congress. Thus in 1967 the Alaska Federation of Natives began operations from offices in Anchorage. After the formation of the Alaska Federation of Natives, the native leadership had to contend with various internal problems, while at the same time approaching the increasingly complex land question. From the beginning, the native leaders of the A.F.N. underwent a form of 'on-the-job-training,' learning how to create a coherent internal organization and learning how to contend with outside groupings both in alliance and opposition. The first major problem concerned the fact that the A.F.N. was a fledgling organization located in Anchorage, without the financial backing of its regional affiliates. A proposal to assess all individual members of regional associations $12.00 a year to support the A.F.N. was rejected at the founding convention. In order to perpetuate the central organization and to maintain a land claims lobby, Mr. Emil Notti, the first president, sought and obtained aid through grants from private foundations and by contracts from Federal agencies. In 1969 these included a grant from the American Association of Indian Affairs for publicity purposes; a contract from the Office of Economic Opportunity for an on-the-job-training program in the Anchorage area; and a Health Rite grant from the Office of Economic Opportunity to provide health services to natives living in the Bethel region (Notti 1969). In order to maintain resources for the land claims lobbying, the A.F.N. had to become a multi-issue pressure group, with an annual budget approaching $1,000,000. One of the more pressing problems faced by the leadership was the inherent centrifugal tendencies of the A.F.N. This problem arose largely from the fact that most of the Federation's regional associations, based on differing ethnic affiliations, had been formed independently prior to the Federation. Each of these regional associations had acquired its own lawyers, and some had formulated their own versions of land settlements. The Federation's eventual policy was to prepare and lobby for a package land claims settlement from the U.S. Congress. Proposals for settlement were negotiated at frequent meetings of the Board of Directors in Anchorage with the advice of the regional lawyers. Following the meetings proposals had to be ratified at meetings of the regional associations. It was a cumbersome process but one which was also compatible with native values of consensus. One issue which was representative of these conflicts involved the conditions surrounding the hiring of Arthur Goldburg (a nationally prominent attorney who had served as Secretary of Labor during the Kennedy and Johnson administrations) as the principal A.F.N. attorney. Goldburg's prestige was considered invaluable for influencing Congressmen. However, lawyers from several regional associations, such as the Kenaitze Native Association, publicly attacked this proposal. One lawyer objected that Goldburg intended to concentrate upon the human and social reasons for a claims settlement without mentioning the legal basis for land claims. He further contended that Goldburg had snubbed attorneys who had been representing native interests for years (Anchorage Daily News, May 14, 1969). Due to these pressures Goldburg resigned his position. This placed the Federation's board in a crisis, especially since some of its member associations supported the actions of their lawyers. The board was evenly divided on the question of accepting Goldburg's resignation, Eventually, a motion was passed, refusing to accept his resignation. Goldburg returned with a guarantee of native unity behind his policies, and most of the regional lawyers subsided from view. Another centrifugal crisis occurred in the fall of 1970 with the temporary secession of the Arctic Slope Native Association, which had objected to A.F.N. proposals for the splitting up of any lands received as a result of a land claims settlement. The A.F.N. proposed splitting the land on a per capita basis, giving more land to regions with more people. The original territory claimed by the North Slope Eskimos, however, was the largest in the State, but had one of the smallest regional populations. Resource use on the tundra required vast tracts of land; moreover the claimed area contained the oil-rich Prudhoe Bay deposits. Eventually a new compromise formula incorporating per capita distribution and a regional allotment was reached. The Arctic Slope Native Association returned to the Federation in December 1970 (Tundra Times, December 16, 1970). Another factor that has to be considered is that the bulk of pressure group activity was actually spear-headed by a small group of natives in confrontations and negotiations in Juneau and Washington, D.C. There were six core native participants: Emil Notti, the first president, an electronics engineer of Athabaskan descent; John Borbridge Jr., a Tlingit high school teacher; Flore Lekanof, an Aleut high school teacher; Don Wright, a contractor and former union official of Athabaskan descent; Eben Hopson, a former State Senator and captain in the Alaska National Guard, of Eskimo ancestry; and Willie Hensley, an Eskimo State Senator. Most of these people have had considerable education and experience with Euro-American society both in Alaska and in the Lower 48 states. Much of their activity involved negotiation with Federal and State politicians, although ultimately their decisions would have to be ratified by middle echelons of native leaders. But they, along with A.F.N. lawyers, took the most active role in formulating claims proposals. The forum for the land claims transaction was basically the U.S. Congress, which conducted land claims hearings before sub-committees representing both the House of Representatives and the Senate. The hearings were held mainly in Washington although on occasion the congressmen heard testimony in Alaskan cities such as Anchorage and Fairbanks, and even in some of the larger towns such as Barrow. By 1969, the native leadership had achieved relative consensus on what a package land claims solution should contain. First of all they wanted a cash settlement to the tune of $500 million for native lands already taken or about to be taken by State withdrawals. A second important demand was for a continuing land base for Alaskan natives for subsistence use and potential economic development. The A.F.N. had maintained that 80 million acres was necessary to fulfil native needs, but they now compromised for 40 million acres: nine townships to be distributed to each village with an additional 500 acres per capita for villages with populations over 184. The final and most controversial piece of the formula was the A.F.N. proposal that native corporations receive in perpetuity 2% of all mineral revenues derived from State and Federal lands, as a continuing compensation for those lands taken in the past and as compensation for the extinguishment of any and all claims against the United States. There were a number of-opposing groups who testified against granting such demands. The most powerful opponent was the State of Alaska, especially the Republican administration of 1969, which may have represented other commercial and industrial interests, which preferred to stay behind the scenes. The State was most vehemently opposed to its participation in a settlement, especially to the provision that the State contribute 2% of its mineral revenues in perpetuity. Governor Miller maintained that no other state had ever been required to participate in a land claims settlement. State officials also objected to the large amount of land (40 million acres) that was to be transferred to native regional and village corporations, since that would interfere with their own selections from the public domain (103 million acres). Depending upon which lands the native corporations selected, the State could lose potential mineral revenues (Miller, 1970). The State administration did not oppose a $500 million cash settlement to be paid by the Federal government since that presumably would infuse a large amount of money into the State's economy. Consistent opposition came from certain economic interest groups within the State. One of the more prominent of these was the Alaska Miners' Association. Its members opposed the possibility that large amounts of land might come under native ownership. They also opposed the principle of revenue sharing on locatable minerals, since this, they contended, would discourage mining explorations in the State (Herbert 1970). The Alaska Loggers' Association also expressed fears that transferring large grants of land to native villages would interfere with operations by their members. It was especially concerned that large tracts of timber land would be cut off from lumbering activities in the southeastern portion of the State (Bell 1970: 672-673). Adamant objections also came from the Alaska Sportsmen's council, a group concerned with sport hunting and fishing and with the lucrative guiding industry. They objected to natives controlling the land resources because it could interfere with non-native hunting and fishing (Boddy 1969: 527-528). Some of the most obvious manifestations of opposition to native demands on land claims and aboriginal rights were to be found in several major newspapers in the State. The Anchorage Daily Times had been one of the most consistent opponents of A.F.N. positions, attacking the legal and moral bases for such claims and citing economic hardships that such legislation could bring upon the State. In reference to one of the bills sponsored by A.F.N., the paper presented an editorial entitled "Asking Too Much." It is normal and natural for the Alaska Native Federation to ask for the entire state in settlement of their claims. Unfortunately even though the sympathy of Alaskans has always been with them in their efforts to win the universal support they need, they are causing serious and perhaps permanent damage to the relations of Alaskans with each other. For the first time Alaskans are finding themselves divided as natives and non-natives. The natives are asking for everything  land, money, and resources on a tax-free basis. The State and the non-natives would have only the marginal property and resources with which to build a tax base that would support the entire population, including the natives. All the oil revenues from the North Slope would go to the natives. All the royalties from the State are turned over to the natives. The natives would have the revenue tax-free. The State would have to look elsewhere for revenue. And when the process was completed, the natives would own all the land that has economic value. They would have the lion's share of the revenues pouring into their treasury. They would control the development of timber, oil and fisheries. The state would have inadequate resources to provide the school, health, sanitation, law enforcement, and other programs that the law requires. Meanwhile, the natives' wealth would he controlled by a presidential commission consisting of five men, three of whom would be natives. They would be the true rulers of Alaska (Editorial, Anchorage Daily Times, December 5, 1969). Perhaps the most interesting aspect of the Alaska Federation of Natives and its activities can be found in an examination of how the members developed tactics of political leverage and influence in their lobbying which were able to overcome opposition and eventually achieve a land claims settlement. Initially they made effective use of the courts. The earliest example of this was when lawyers acting for the village of Minto had injunctions placed upon State selections of land in that village. Other groups such as the residents of Tyonek and Tanacross, on the advice of their lawyers, sought injunctions against Federal or State takeovers of their land. Upon reviewing some of these legal cases, Secretary of State Udall imposed the land freeze in 1966 because of the laws stating that native land utilization was not to be disturbed. However, one should point out that Udall's freeze was strictly an arbitrary executive decision. One informant speculated that Udall, a Federal Democrat, may have imposed it to cause the incoming State Republican administration some difficulties. At any rate the freeze proved to be the major leverage in favour of native positions. At first the Alaska Federation of Natives threatened to take their land claims proposals to the U.S. Court of Claims. This could have been an extremely laborious procedure, perhaps taking as long as 30 years, thus holding up State selections of land and further economic development of the State. This created a sense of urgency for the State, the natives, and commercial interests that a quick resolution of the land claims through a political solution in the Federal Congress should be achieved. Succinctly expressed, the pragmatic reality of an Alaskan Native Land Claims Settlement Act was recognized, and because of the continuing existence of the freeze, proposals for a settlement gradually shifted in favour of native demands. Once it was established by Congress and the courts that there must be a solution in order to clarify land title in Alaska, native leaders could then supplement this land freeze leverage with other tactics. First of all, A.F.N. executive members, the board of directors, and the lawyers carried out the traditional American lobbying techniques of "walking the Halls of Congress" attempting to influence key members of Congress and important members of the Senate and House of Representative Committees on Interior and Insular Affairs, which would eventually formulate the bills to be presented to Congress. They also prepared legal and socioeconomic testimonies which were presented to the Congressional hearings on the land claims settlements that were held in Washington, Anchorage, Fairbanks and in some of the larger settlements of Westward Alaska. The Federation also sought the normative support of the American public through national television appearances, press releases, and publications stressing the poverty of Alaskan natives and the fact that their dual economy was being threatened by oil exploration and other commercial activities. It is interesting to note that the Federation in its appeals to the American public, tended to concentrate more on influencing public opinion in the "Lower 48" than it did within Alaska itself, probably realizing that Alaska's Congressional delegation of two Senators and one member of the House of Representatives would make little difference in the final voting leading to a Native Land Claims Settlement Act. Related to this tendency for the A.F.N. to circumvent Alaskan power bases and non-native Alaskan public opinion was the fact that the organization was successful in allying itself to a seemingly influential network of what might be termed "liberal" interest groupings. These included the American Association of Indian Affairs, the Ford Foundation, the United Auto Workers, the National Council of Churches, and the National Congress of American Indians; these provided endorsements, financial assistance, office space in Washington and probably some direct influence upon congressmen. The A.F.N. had gained the sympathetic interest and assistance of such notables as Arthur Goldburg, Ramsey Clark, Thomas Kuchel, and Senators Edward Kennedy and William Proxmire. The most significant and probably most useful instance of this support came from the New York-based American Association of Indian Affairs (A.A.I.A.). This organization was an important initial catalyst in the formation of some of the regional associations. Throughout the land claims negotiations the A.A.I.A. provided financial and moral support to the native cause. Through its newsletter, Indian Affairs, it informed the American public of the desires and problems of Alaskan natives. The A.A.I.A. was primarily responsible for the Federation's acquiring the legal services of Ramsey Clark and Arthur Goldburg, and because of the A.A.I.A. 's longtime activities of supporting legislation on behalf of American Indians it was probably instrumental in introducing A.F.N. members to key Federal Congressmen. One should point out here that although the A.F.N. did rely upon the existence of outside organizations and individuals, that use itself is an indication of the political capacity of the core members of the A.F.N. in their recognition of the complexities of American politics. Finally, although much of the lobbying activities of the A.F.N. were directed outside of the State of Alaska, the growing realization that the increasingly politicized native electorate represented a "swing vote" potential ensured that Alaska's Congressional delegation would not ignore or completely oppose the issue, but would work towards some kind of compromise settlement in Congress. On a very broad perspective Alaskan politicians had to be aware of the fact that native people represented at least one-sixth of the total population of the State (51, 528 out of 302, 173 in 1970), and, as Rogers suggests, their voting potential might be higher, since transient residents such as the military and their dependents tend to have very low voting records (Rogers 1971: 290). The majority of native people have traditionally voted for Democrats (Harrison 1970) but the 1966 election saw Republicans Governor Walter Hickel and Congressman Howard Pollock elected by narrow margins (Hickel by 980 votes, Pollock by 2,173) aided by significant Republican shifts in such areas as District 15, a largely Athabaskan district (State of Alaska 1966). Native politicians have also steadily improved their positions and numbers in the State Legislature. In 1970 two native senators (out of a total of twenty) and five State Representatives (out of a total of forty) were elected, with only one non-native still representing a predominately native district. Many other districts with non-native majorities still had significant native minorities, hence white politicians had to be conscious of native interests. 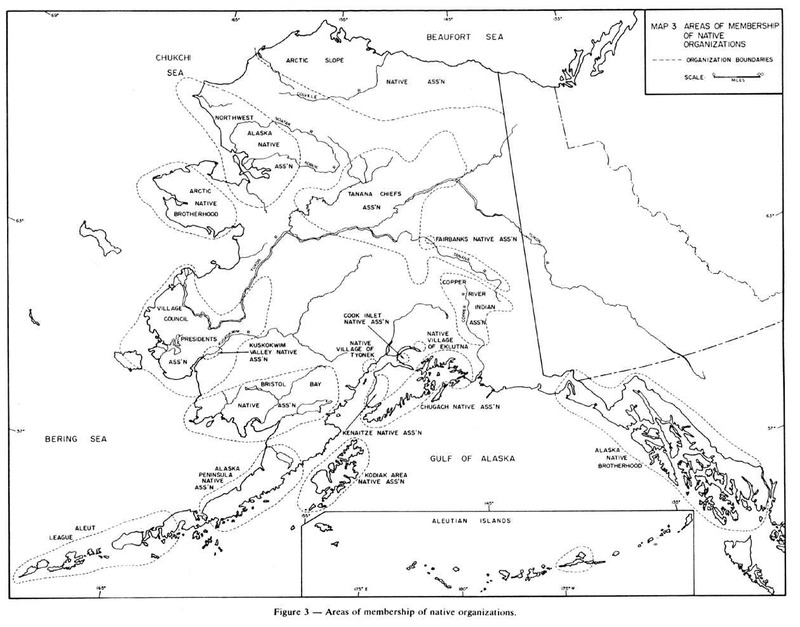 All of these factors, the urgency of removing the land freeze, the successful lobbying techniques of the A.F.N., and the growing politicization of Alaskan natives, led to the passage of the Alaska Native Settlement Act of 1971 (PL 92-203, 85 Stat. 688). The Alaska Native Claims Settlement Act was passed in both houses of the U.S. Congress on December 18, 1971. Section 6 of the Act provides for a cash settlement of $462.5 million to be paid over a period of eleven years with 4% annual interest to be paid on amounts delayed in payment by six months. Section 4 provides native corporations with 2% annually of the Federal and State leasable mineral revenues until a total of $500 million has been collected. Section 12 gives natives title to 40 million acres of land. Villages will receive surface rights to 22 million acres and an additional 2 million acres will be used for miscellaneous purposes such as 160-acre allotments to natives not currently residing in villages (see French 1972 for further details). The particulars of this act are remarkably close to the original A.F.N. proposals and must be considered a tribute to the developing political acumen of the A.F.N. members. Twelve regional corporations are being formed, in which each enrolled resident is given 100 shares. These corporations are to take subsurface rights to the lands and to collect and administer the money from the cash settlement on the basis of population. Village corporations affiliated to the regional corporations are being formed in 220 villages; they will receive surface rights to lands around their villages according to population. Each regional corporation must distribute 50% of cash grants and subsurface revenues to village corporations, although they may withhold money until the village has provided suitable plans for village projects. It is too early to assess the operations of regional corporations. However, in 1973 the newly formed Arctic Slope Regional Corporation borrowed $2,265,000 to assist in management and financial training in order to administer land selections and to form two sub-corporations: Inupiat Builders Inc., involved in the construction of 16 homes at Kaktovik and Anaktuvik Pass, and Tundra Tours, which is building a 40-room hotel in Barrow (Arctic Gas 1974). Although we know little of the operations of the Act, some speculation on future consequences is in order. It has been frequently emphasized that native Alaskans need a large land base for extensive use of wildlife resources (Buckley 1957; Klein 1966; Task Force on Alaskan Native Affairs 1962). To a certain extent native people will have a continuing guarantee of some land access. Whether it will continue to support the dual economy in its present state remains to be seen, but it may at least provide a gradual transition to a more comprehensive cash economy, if that indeed is necessary. There are many other potential economic benefits. For one thing native villagers are quite conscious of desirable improvements in their villages; following the Tyonek example they could build new homes and board walks, improve airfields and create better sanitation facilities (Kuskokwim-Yukon Economic Development Board 1969). There could be improvements in small-scale village enterprises which already exist, such as sawmill and timbering operations. Natives in the Yukon and Kuskokwim River deltas might take advantage of Japanese interest in purchasing chum salmon by constructing freezer and packing plants. Abrahamson (1968: 1) points out that greater native participation in commercial fishing could be encouraged through training and technical guidance, and by modernizing their skills and gear. Several authors have suggested that the native reindeer industry could be revitalized and made into a profitable enterprise with expanded markets in Japan and elsewhere (Brady 1968: 15). The mining industry (of locatable minerals), once so important in Alaska's history, might also re-emerge using native capital and labour. Besides these possibilities for local and rural development, native corporations might invest some of their money in urban real estate and private companies, following the Tyonek example. Most importantly, native corporations will likely benefit from revenues from mineral and other economic developments on their own lands. From all of these possibilities, the overall economic situation of Alaskan natives might improve whether or not their subsistence base remains on the land. The economic infrastructure as well as the consuming power of rural natives might improve. This would hopefully provide an incentive for better transportation and communications facilities in rural Alaska (e.g., roads, railroads, steamer services along the larger navigable rivers) which in turn would encourage cheaper consumer services and again reinforce further economic developments such as mines. There are of course some negative possibilities that could affect native economic development. Obviously, as with any corporate situation there are the risks of incompetent management and internal conflict over the use of money, land, and resources. Also it is likely that some regions may be more favoured with regard to natural resources and thus profit more than some of their neighbouring native corporations. Differential population growth might lead to dominant non-native majorities in some regions clamouring over land and resources. This has happened before in American history, a noteworthy example being the alienation of Indian lands in Oklahoma from 1896-1904, as recommended by the Federally appointed Dawes Commission (see Debo 1961). But no doubt native leaders, in their developing political capacity and knowledge of American history, are alert to these possibilities. However, because of the Act there is the overall possibility of a new era of culture change in native Alaska. The native political elite has demonstrated its capacity for influencing political change, which is almost a necessary prerequisite for the control of other institutional and cultural areas. With proper management this could now be followed through with much greater native control over the direction of economic, social and educational changes. The strategies of the Alaska Federation of Natives stand out in contrast to previous attempts by American Indian groupings to preserve and promote their minority rights. The Alaska Federation has attempted to create new power and influence for its constituents and has met with a large measure of success. Its members have done this by utilizing the techniques of communication and influence which evolved earlier within American society. The emergent native leadership had wished to establish a secure native economic and political base in Alaska before acculturative forces led to further breakdowns of native culture and society. The end result could have been assimilation or a marginal social and economic situation. The key to this eventual breakdown would have been the loss of the traditional access to land and resources which has provided a certain amount of autonomy as a buffer against the growing influences of urban Alaska. Insofar as the native people might participate in future in the economy of the State, it would seem that their role would have been small, given a lack of capital and job skills. Further, if village viability were broken by this erosion of traditional economies then many might have migrated to urban centres. Villages in their isolation provide additional protection for native cultures, but their decline would have contributed to further culture loss. Skid-row life-styles, coupled with experiences of racial prejudice, might have been the fate of many, at least during the initial stages of urbanization. Village strengths of kinship and friendship solidarity and of economic reciprocity often become distorted and disdained evidences of poverty cultures to the ill-informed non-native urbanite. Even those native people still remaining in their villages might have found their communities transformed, almost overnight, into caricatures of small American towns or cities. Fortunately there was a reservoir of leadership potential among natives to combat these adverse possibilities. This potential has rested in a cadre of natives, altogether numbering perhaps 200, some of whom had partial native ancestry yet maintained legal native status and felt native in identity. More importantly, they felt a sense of pan-nativism, which was necessary to the development of the movement. Through individual acculturative experiences in the U.S. Armed Forces, in cities both in Alaska and in the Lower 48, and sometimes in higher educational systems these people came to master the mysteries of political and communication tactics of American society. It is interesting to note that some of the earliest land controversies, such as Project Chariot, the duck-hunting confrontations, the Rampart Dam proposal and State selections of village lands, evoked initial grass-roots responses of protest. The publicity over these events helped reinforce the credibility of the native leadership elite as being generally representative of native attitudes. After the initial stages of grass-roots response, the movement essentially became one which was directed by an elite and it also must be admitted that the tactics of influence bore little resemblance to traditional native means of confronting and communicating with other societies. With the exception of southeastern Alaska, interest group activity and sophisticated political pressure tactics were behaviours foreign to native Alaskans. However, these behaviours were employed as a means to ensure the protection of existing individual strategies centred around the dual economy and to promote the possibility of continuing culture growth through new opportunities of participation in rural economic development. Whether or not the native people of Alaska will be successful in implementing the provisions of the Alaska Native Claims Act of 1971, their leadership has already exhibited considerable political capacity in influencing the passage of that act. Abrahamson, J.D. 1968. Westward Alaska, the native economy and its resource base. Anchorage: Federal Field Committee for Development Planning in Alaska. Anchorage Daily News 1969. Anchorage: Northern Publishing Company. Anchorage Daily News 1969. Anchorage: Anchorage Times Publishing Company. Arctic Gas 1974. An analysis of the socio-economic impact in Alaska of the Alaskan Arctic Pipeline Company pipeline. Prepared by Urban and Rural Associates. San Francisco. Arnold, R. 1969. Characteristics of the economy of Village Alaska. Twentieth Alaska Science Conference. College: University of Alaska. Bank, T.D. 1958. The Aleuts. Scientific American. November 1958: 112-120. Bell, D. 1970. Letter to Hon. Wayne Aspinall from Donald A. Bell. Secretary Manager, Alaska Loggers Association Inc. Hearings before the Subcommittee on Indian Affairs on Alaska Native Land Claims. House of Representatives, 91st. Congress, Part II, Serial No. 91-8. Washington: U.S. Government Printing Office. Boddy, A.W. 1969. Statement of A.W. 'Bud' Boddy, Executive Director, Alaska Sportsmen's Council. Hearings before the Committee on Interior and Insular Affairs on Alaska Native Land Claims. U.S. Senate, 91st. Congress, Part II. Washington: U.S. Government Printing Office. Brady, J. 1969. The reindeer industry in Alaska. Alaska Review of Business and Economic Conditions, 5:3. College: University of Alaska. Buckley, J.L. 1957. Wildlife in the economy of Alaska. Biological Papers of the University of Alaska 1. College: University of Alaska. Chance, N. 1966. The Eskimo of North Alaska. New York: Holt, Rinehart and Winston. Chance, N. 1969. Directed change and northern peoples: suggested changes in light of past experience. Twentieth Alaska Science Conference. College: University of Alaska. Debo, A. 1961. The rise and fall of the Choctaw Republic. Norman: University of Oklahoma Press. Drucker, P. 1958. The native brotherhoods, Smithsonian Institute, Bureau of American Ethnology Bulletin 166. Washington: U.S. Government Printing Office. French, S. 1972. The Alaska Native Claims Settlement Act. The Arctic Institute of North America, Montreal. Harrison, G.S. 1970. Electoral behaviour of Alaska native villages. Institute of Social, Economic and Government Research, Research Note, G1. College: University of Alaska. Hensley, W. 1970, Arctic development and the future of Eskimo societies. Indian Truth 47: 1-8. Herbert, C. 1970. Statement of Charles Herbert, Alaska Miners Association, in Hearings before the Subcommittee on Indian Affairs on Alaska Native Land Claims. House of Representatives, 91st Congress, Part II, Serial no. 91-8, Washington: U.S. Government Printing Office. Hinkley, J.C. 1968. Reflections and refractions: Alaska and gilded-age America, in Alaska Review Frontier Alaska. A study in historical interpretation and opportunity. Anchorage: Alaska Methodist University Press. Hippler, A. 1968. Some unplanned consequences of planned culture change in higher latitudes of North America: socioeconomic studies in regional development. Boreal Institute, University of Alberta, Occasional Publication 6: 11-21. Hippler. A. 1969. Patterns of migration, urbanization and acculturation. Twentieth Alaska Science Conference. College: University of Alaska. Jenness, D. 1962. Eskimo administration I: Alaska. Arctic Institute of North America Technical Paper 10. Montreal. Jenness, D. 1968. Eskimo administration V: Analysis and reflections. Arctic Institute of North America Technical Paper 21. Montreal. Klein, D.R. 1906. Waterfowl in the economy of the Eskimos on the Yukon-Kuskokwim Delta, Alaska. Arctic 19: 319-332. Kuskokwim-Yukon Economic Development Planning Board 1969. Resolutions. McGrath, Alaska. Lantis, M. 1973. The current nativistic movement in Alaska. In G. Berg, ed., Circumpolar problems. Habitats, economy, and social relations in the Arctic. Oxford: Pergamon Press. Miller, K. 1970. Statement of Hon. Keith Miller, Governor of the State of Alaska, in Hearings before the Subcommittee on Indian Affairs on Alaska Native Land Claims. House of Representatives, 91st Congress, Part I, Serial No. 91-8. Washington: U.S. Government Printing Office. Notti, E. 1969. President's Annual Report to the Alaska Federation of Natives. Ms. Anchorage. Oswalt, W. 1967. Alaskan Eskimos. San Francisco: Chandler Publishing Company. Rogers, G.W. 1962. The future of Alaska: economic consequences of statehood. Baltimore: Johns Hopkins Press. Rogers, G.W. 1971. Goodbye, great white father figure. In Pilot, Not Commander. Anthropologica 13: 279-307. State of Alaska. 1966. Official returns by election precinct. Juneau: Secretary of State. Task Force on Alaskan Native Affairs 1962. Report to the Secretary of the Interior, Juneau. Truman, D. 1951. The governmental process. New York: Knopf. Tundra Times. 1970. Fairbanks: Eskimo, Indian, Aleut Publishing Company.